But how much can it deliver? And how will it explain its non-delivery in the past? 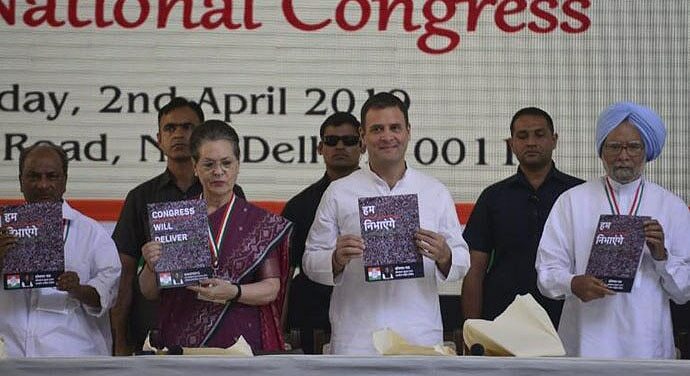 As is customary for political manifestoes to do, the Congress' manifesto on March 2 promised the voters a slew of populist schemes and sops in what the party says would be its ‘final assault on poverty’. A key component of the manifesto that, however, escaped relative scrutiny was the promises made with regard to the security and humanitarian crisis facing the state of Jammu and Kashmir in general and the Valley in particular. With rising extremism in Kashmir, the Congress fails to explain how it plans to tackle the situation by deployment of police forces. The police force in no part of India is equipped or trained to deal with militancy. It is the army and the paramilitary which is trained to do the job. By saying that it plans to deploy more police personnel for maintaining law and order, the Congress makes it known that it considers the violent militancy issue a 'law and order' problem. This is a rather naive view of the situation in the Valley. By talking about reviewing the Armed Forces (Special Powers) Act (AFSPA) at a time when the security situation in the Valley is so fragile, the Congress is only demotivating the security forces. Several videos in the recent past have shown stone pelters targeting convoys of security forces — at a time like this, diluting the powers of the armed forces would only worsen the security situation. AFSPA was first implemented in Kashmir in 1990, at the height of militancy. It was also needed by security forces to launch search operations in villages where militants took refuge. Terrorists from across the border also use the houses of local Kashmiris to hide — mostly forcibly. The sad reality is that militancy in Kashmir is again rising. This promise cannot be read in isolation. 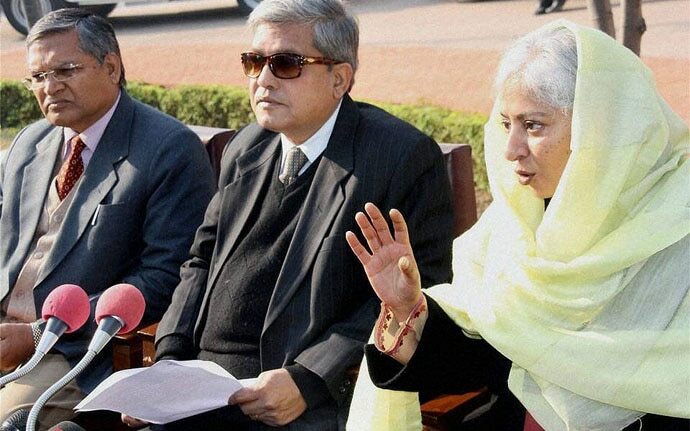 We must revisit the last instance when the Congress appointed interlocutors — exactly three — as part of its reach-out plan for Kashmir after the 2010 unrest which left 120 people dead. In 2010, the United Progressive Alliance (UPA) government, led by Manmohan Singh, appointed the journalist Dileep Padgaonkar, the academic Radha Kumar and professor MM Ansari as interlocutors. The report submitted by the J&K interlocutors was ignored by the very same government that sent the three to Kashmir to prepare the report. So, the UPA basically sent the three people to talk to people, recommend solutions, navigate an extremely difficult situation — and then do absolutely nothing about it. About nine years since that exercise, the Congress is promising an encore of the ‘interlocutor tour of Kashmir’. The party that Congress can probably have a dialogue with — assuming it comes to power — is Pakistan. If there is one country on the face of the earth which has shown contempt for dialogue though, it is Pakistan. But the Congress is promising voters the same fallback option of talks with Pakistan. The one significant promise that the Congress has made in the manifesto is the promise of free and fair elections in the Valley. The Congress itself stands often accused of helping with rigging the 1987 elections in favour of Farooq Abdullah and his party, the National Conference. Many believe that these elections were a turning point in the history of Kashmir — pushing youths towards militancy. Many parties — like the Jamaat-e-Islami, the People's Conference and the Ittihad-ul-Muslimeen, which were on the losing side — became part of the main separatist alliance, the All Party Hurriyat Conference, calling for self-determination. 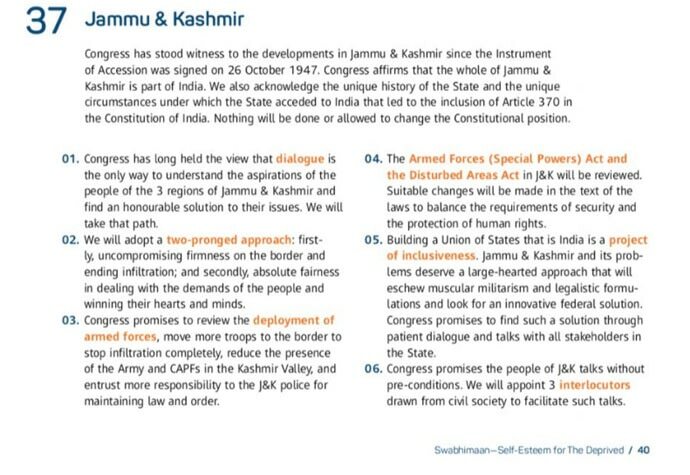 The promises in the Congress manifesto vis-a-vis Kashmir need to be questioned, because we cannot afford to lose more lives to the flawed policies of governments in power. Or, further cynical manipulations. Also read: Why the Congress manifesto could be taken with a pinch of salt!